Sign the user comitment and get access to the registered users' section. FAQ - How to represent ... with WAG ? The INI-WAG kit is finally produced and available, as well as a tutorial! Please check prices and conditions of use and contact us if you want one ! Le kit INI-WAG est enfin produit et disponible, ainsi qu'un manuel en français. Prenez connaissances de nos tarifs et conditions d'usage et contactez-nous pour commander le votre! 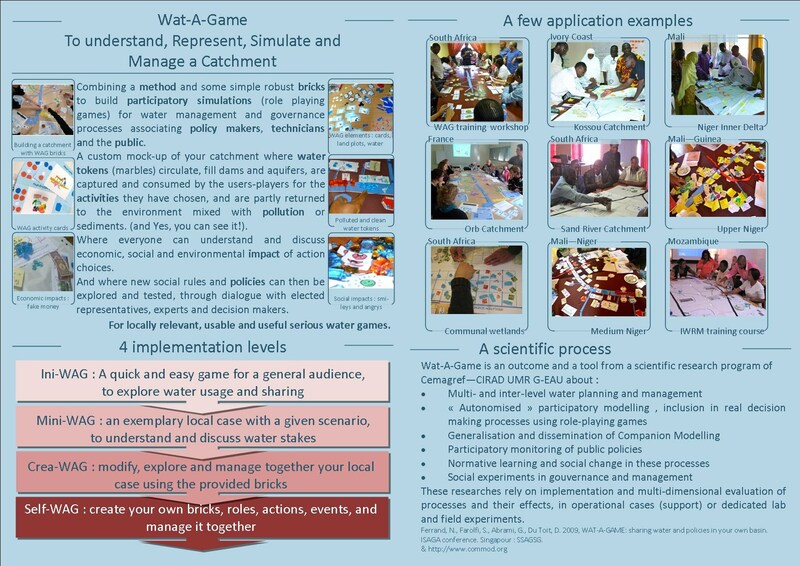 WAT-A-GAME (WAG) is an open toolkit and a method based on simple bricks and a supporting software for designing and using participatory simulations (i.e. role playing games) for water management, policy design and education. It can be easily used for your own cases, at different scales and for various water related issues. It shows explicitely how water flows, how it is polluted, transformed, shared, used... Participants can choose how they take water, use it, give it. They can decide among various actions or strategies for themselves and the community, with consequences on their household economy, their satisfaction, labor, and the surrounding ecosystems. Meanwhile, new policies can be invented and tested in the group. WAG in Korea! WAG has been used twice in Korea for introduction to sustainability issues... cf Sessions records. Training courses agenda is here ! A micro-WAG kit is now available for discovering Wat-A-Game. 100 copies have been sent to the WAG community with a greeting card.